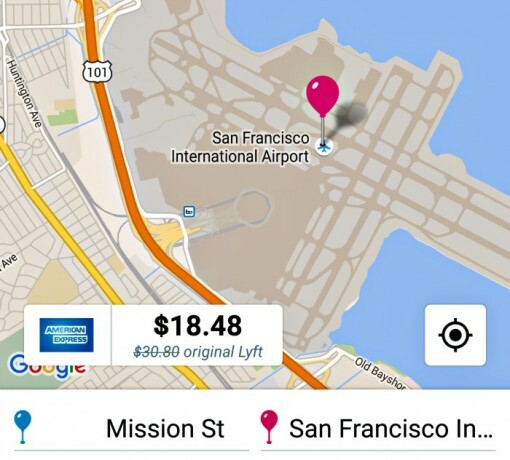 How much does it cost to take a Lyft from San Francisco to SFO airport? I’ve taken Lyft to San Francisco International (SFO) a handful of times and though it’s not the cheapest way to get to the airport, it’s cost-effective for the great conveniences it provides. Since you’re reading this post, I imagine you’re looking for a quick and affordable way to get from the city to SFO. If you’re considering a Lyft to the airport, I recommend Lyft Line because it offers up very affordable fares for airport transportation (as I’ve referenced in past posts to JFK and Las Vegas McCarran). In my handful of times taking a Lyft Line from central San Francisco (usually the Mission, SoMa and Union Square area) to the airport, the cost has been as low as $15.20 from SoMa to as high as $24.46 from Union Square. Here are the five times I’ve used Lyft Line to get to SFO with pick up area, cost of fare (before tip), duration of the ride, the distance to SFO and whether I shared the ride with another passenger. Taking in those five rides as truth, the average cost of a ride from San Francisco to SFO is $19.93 (before tip). These have been all regular Lyft Line fare and not during Prime Time which can add an additional $8-15 to your trip depending on the demand at that time. And Lyft Line is fast; the average timr it took to get from the city center to the airport was just 22 1/2 minutes (the rides have been as short as 16 minutes and as long as 30). Since this is Lyft Line, the duration of the trip sometimes includes a passenger so it’s not completely an apples-to-apples comparison. There’s no preparing for whether you’ll be solo or sharing your ride with Lyft Line, so always build in an extra 10 minutes to your trip. For me, an extra passenger has never been a problem. Remember, you’re not just sharing a ride, but splitting the fare so it’s worth the extra planning. Lyft is continually improving the Lyft Line algorithm, so the extra time spent dropping off/picking up a passenger is minimal. At an average $20 fare, it’s worth the extra $12 to not have to drag your luggage down to the nearest BART station (approximately $8) and up to the Airtrain. Lyft will pick you up wherever and drop you off right in front of your terminal. For roughly the same price, you don’t have to jump into a Super Shuttle an hour earlier so it can pick up six other passengers before finally heading to SFO. A taxi to the airport? That can cost you anywhere from $30-45. All things considered, Lyft is a great option from both a convenience and money stanpoint. Hey since the average ride costs around $20, you can get your ride to SFO for free with a $50 in Lyft credit. Just enter STUART12 promo code into the payments section.